A pack of 25 assorted LEDs. Contains 5 Diffused Reds, 5 Diffused Yellows, 5 Diffused Greens, 5 Clear Blues and Clear Whites. Forward Voltages are Red 1.9-2.0V, Yellow & Green 2.0-2.1V, Clear Blue and Clear White: 3.0-3.2V. Comes with some 200 ohm, 1/4-watt resistors for making connections. 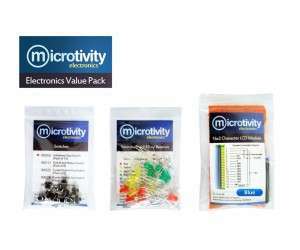 Packaged in a resealable zip lock bag for your ease of use.